WARNING: There are risks of traveling to parts of Ukraine under control of pro-Russian separatists (Luhansk and Donetsk). While tourists are unlikely to be the intended targets of violence, government services (police, hospitals, firefighters) are not available in these areas. Crossing from Russia into occupied areas is illegal. Crossing into Russia from the stable Northeast is not recommended. Crimea has been under Russian control since its annexation in 2014 and should not be considered a part of Ukraine for travel purposes. Travelling to Chernobyl and the whole radiation zone which includes the ghost city of Prypiyat should at all costs only be done with tours. Travelling there without a tour is forbidden. Stay with your tour group at all times. Wandering off or travelling without a tour can result in fines and radiation exposure that may cause serious illnesses, death or coma. Ukraine (Ukrainian: Україна) is a country in Eastern Europe. It lies at the northwest end of the Black Sea, with Russia to the east, Belarus to the north, Poland to the northwest, Slovakia and Hungary to the west, and Romania to the south west and south, with Moldova in between. Ukraine takes its roots from the establishment of the East Slavic state Kyivan Rus (IX-XIII centuries). Since then, Ukraine preserved its geographical location, capital and national customs (including Kyivan Rus state emblem). Ukraine's population is reducing because of low birth rate, increased mortality (especially among males), low immigration and high emigration. While this state fell prey to Mongol conquest, from the 14th until the 18th century, the western part of Ukraine became part of the Polish-Lithuanian Commonwealth. A subsequent Ukrainian state was able, in the face of pressure from the ascendant Muscovy, to remain autonomous for more than a century, but in the 18th century the Russian Empire occupied much of Ukraine. Despite a brief, but uncertain, flash of independence at the end of the Czarist regime, after the Russian Civil War in 1922, Eastern Ukraine was incorporated into the new USSR and suffered two disastrous famines deliberately organized by the Soviet leaders, when millions of Ukrainians died of hunger (1932-33 and 1946, the first one known as the Holodomor) as well as brutal fighting during World War II. When it came to Western Ukraine, after 1918, when the old European empires fell after the 1st World War, Ukrainians lost in conflict over this territory with Poles. As an aftermath, between 1918 and 1939, Poland tried to forcibly Polonize these lands with badly-designed policies, which backfired and brought both hatred from ordinary Ukrainians. As a Soviet republic, the Ukrainian language was often sidelined to Russian and actively Russified, for example: during Stalinist repressions during the 1930s; during attempts at decentralization during the Khrushchev administration; and tightening of control again during the Brezhnev-Kosygin era of the 1970s and early 1980s. The bilingual province had signs in both Russian and Ukrainian in virtually all cities, including Lviv, where Ukrainian is most prevalent. The 1986 Chernobyl accident increased pressure on the central government for autonomy. Ukraine first declared its sovereignty from the Soviet Union in July 1990 (And also in 1918). Following the results of a referendum in 17 March 1991 which indicated overwhelming popular support (80% in favour of independence), the Ukraine's Parliament declared its Independence Day 24 August 1991. Initially, there were severe economic difficulties with hyperinflation, and oligarchic rule prevailed in the early years. The issues of cronyism, corruption and alleged voting irregularities came to a head during the heavily-disputed 2004 Presidential election, where allegations of vote-rigging sparked what became known as the "Orange Revolution". This revolution eventually resulted in the election of opposition candidate Viktor Yushchenko as President. During the following five years the Orange coalition broke up and Viktor Yushchenko lost the support of the majority of Ukranians. Ironically, his former adversary Viktor Yanukovich was elected President. In February of 2014, after three months of street protests in Kyiv and all over Ukraine, Viktor Yanukovych was deposed after he had refused to sign a deal with the European Union the previous November. In 2014, Russia made several military incursions into Ukrainian territory, which resulted in Crimea annexation and the beginning of the War in Donbass. Petro Poroshenko, a pro-Unity Ukrainian politician won the 2014 presidential election and is the fifth president of independent Ukraine. The Ukrainian government is now actively fighting against the Russian occupation. In May 2017, Ukrainian citizens with Biometric Passport gained visa-free entry into the Schengen Area. The heavily industrialised and Russified coal-mining region of the Donbas, home to big Soviet cities and much of the country's ethnic Russian population. The Kyiv Pechersk Lavra in Kyiv, Ukraine. First built in 1051. Potemkin Stairs in Odesa which extend for 142m. They were so well designed that they create an optical illusion. A person looking down the stairs sees only the landings, and the steps are invisible, but a person looking up sees only steps, and the landings are invisible. Freedom Square, in Kharkiv. The third largest city-centre square in Europe. The Swallow's Nest, one of the Neo-Gothic chateaux fantastiques near Yalta, Ukraine. Uman - city in central Ukraine with the famous "Sofiyivka" park. Crimea, Luhansk and Donetsk regions are occupied by the Russian Federation. Currently, Ukraine has no jurisdiction over these territories and suggests visitors to avoid traveling there for safety reasons. Anyone who arrives at the Russia-Ukraine border checkpoint that isn't under the authority of Ukraine (in territories occupied by Russia) will not be allowed further entry into Ukraine. More up-to-date country-specific information and requirements may be available at Ukraine's Embassy website. You may find a list of embassies of Ukraine here, on official government MFA website: press 'Find an Embassy' and select your region and then country or visit MFA website, Visa requirements page. Citizens of all European Union member states, Albania, Andorra, Belarus, Brazil, Canada, Chile, Iceland, Israel (except those who travel with 'teudat maavar'), Japan, Kazakhstan, Kyrgyzstan, Liechtenstein, Macedonia, Monaco, Mongolia, Montenegro, Norway, Panama, Paraguay, Russia, San Marino, St. Kitts and Nevis, South Korea, Switzerland, Tajikistan, Turkey, the United States/American Samoa and Vatican City can visit visa free for up to 90 days within a 180 day period. However, citizens of Kyrgyzstan and Tajikistan must also have proof of sufficient funds when arriving in Ukraine. For citizens of Mongolia, the visa free only applies to service, tourist and private trips on conditions that documents certifying the purpose of the trip are provided. Those holding a diplomatic or official/service passports of Albania, Cambodia, China, Cuba, Dominican Republic, Egypt, Iran, Kuwait, Laos, Morocco, North Korea, Peru, Qatar, Singapore, Thailand, Turkmenistan, Uruguay, Venezuela and Vietnam and only diplomatic passports of India and Mexico do not require a visa for Ukraine. Citizens of Antigua and Barbuda, Australia, the Bahamas, Bahrain, Barbados, China (PRC), Dominica, East Timor, El Salvador, Guatemala, Grenada, Guatemala, Honduras, India, Indonesia, Kuwait, Macau, Malaysia, Mauritius, Mexico, Micronesia, New Zealand, Oman, Palau, Peru, Qatar, Saint Vincent and the Grenadines, Samoa, Saudi Arabia, Seychelles, Singapore, Trinidad and Tobago, Tuvalu, the United Arab Emirates and Vanuatu can visit Ukraine for up to 15 days, provided that the citizens of the countries obtain a visa at the Kyiv Boryspil Airport, Kyiv Zhuliany Airport or Odesa Airport (as of August 2017). Since January 1st, 2019 the visa service upon arrival is no longer available at those airports, so you'd better check the possibility of obtaining an e-visa before planning a trip to Ukraine. Please note, the Visa Office at the airport is only open between 9:00am and 7:30pm. Arrivals outside of these hours must first wait for the office to open before a visa will be issued and then proceed to Passport Control. It is also important to note that at times, the Visa on Arrival office may suffer from a lack of manpower (for example, a single officer to deal with a plane of passengers manually doing data entry for all fields of the application form as well as single handedly doing all necessary checks and controls). This can lead to delays in exiting the airport of 2-4 hours, which is especially crucial to note for transit visa applicants hoping to do a day trip into Kyiv. If you have limited time, then you may consider an ordinary visa application at your embassy. Payment for Visa on Arrival can be done by credit card. For other countries, visas are obtainable within a few hours of visiting a Ukrainian consulate/embassy. 'Letter of invitation' from friend, family member, perspective lodging or business provider may be required. For the most up-to-date details, visit MFA website, Visa requirements page and select your country from the list. Information below may be not up-to-date. Citizens of Australia, Albania, Guatemala, Malaysia, Mexico, New Zealand and Singapore do not require a invitation letter to visit Ukraine. The cheapest way to fly into Ukraine is through the Boryspil (KBP) or Zhuliany (IEV) International Airports, both near Kyiv. Other big cities with international airports and direct international flights include Odesa, Lviv, Kharkiv, Dnipro, Zaporizhia and others. The main international hubs for these flights are Amsterdam, Budapest, Frankfurt, London, Milan, Munich, Oslo, Prague, Rome, Vienna, Warsaw and Istanbul with several flights a day of Austrian AUA, CSA Czech Airlines, LOT, Lufthansa, Wizz Air, Alitalia, Air France, British Airways, KLM, Norwegian; also Ukraine International, which code-shares on these routes with the respective carriers. Special offers on flights come and go, depending on the whim of the carrier. As of 2015, Ukraine has suspended all flights from Russia due to Crimea occupation, so you can't reach Ukraine from Russia in any way via air. Low-cost airline Wizzair started operations from other countries and within Ukraine as well. There are two other low cost carrier serving Ukraine. One of them is AirBaltic, with flights routing through either Riga, Latvia, or Vilnius, Lithuania. And the second one is Pegasus with flights from Istanbul to Kharkiv, Lviv, Zaporizhzhia. Be advised that if you have a lot of baggage, Wizzair offers 30kg against the others 20kg allowances. Since May 2017, Ukrainian national carrier Ukrainian International Airlines has also launched some low-cost tickets (starting from EUR 8-10) to international and local destinations available for pre-order at least 6 months before the flight date. There are several airlines which offer direct flights to cities like Dnipro (Lufthansa), Odesa (LOT, Austrian, CSA Czech Airlines), Kharkiv (Austrian Airlines, Flydubai, Airarabia, Pegasus) and Lviv (LOT, Austrian Airlines), but they are more expensive. To fly inside Ukraine, the most common airline is Ukraine International Airlines. It is the unofficial national airline, and its routes cover all of Ukraine's major destinations. Planes used are newer Boeing 737 aircraft. Aerosvit also introduced flights within the country from its hub in Kyiv, mainly flying newer Boeing 737 and 767 aircraft. There are daily direct overnight trains from Berlin, Vienna, Košice (change there for Prague), Warsaw, Belgrade, Bratislava, Budapest, Bucharest and Sofia to Lviv or Kyiv. When coming from Western Europe there will be a 2-3 hour wait at the border while the train's bogies are changed in order to adapt to a different rail gauge. It's generally quicker and cheaper to buy a ticket to the border and then change trains, rather than wait getting through train. Yet, there is a new daily train from Przemysl (Poland) that takes around 3 hours to get to Lviv and 8 hours to get to Kyiv. It departs at 14:26 and costs around 7 euro. Since there might be a lot of traffic at the border, it is a convenient way to travel from Poland. Alternatively, one can travel from eastern Hungary to Ukraine by a local train on a special track. This trip takes about 10 to 15 minutens and one pass customs after or before boarding the train (which saves a lot of time). Connections to Lviv and Kyiv are good and cheap as is a connection on the larger Hungarian cities. Scheduled buses are the fastest way to get through the border, since they do not have to wait in line (like cars have to) and do not have to change bogies (like trains have to). There are inexpensive direct bus services to Lviv and Ivano-Frankivsk from Poland. They usually offer a budget level of comfort and cost about UAH90-100 (€10). (Many buses can be found, for example Krakow to Lviv or Warsaw to Lviv. A quick Google search will give you many options. Be prepared for long delays at the border if you travel by coach or train. There are very few facilities on the Ukranian side so be sure to take food and water. The best option is to take a train originating at Warsaw or Wroclaw. These are faster, more comfortable and have a buffet car. It is possible to alight in either Lvov or Kijev. There is a daily bus from Kosice (except Sunday and Monday) and Presov going to Uzhhorod. There are also several daily buses from Michalovce to Uzhhorod and back, no reservation required, standing passengers are also allowed. Countless buses connect Lviv and Kyiv directly with Prague and some other Czech cities, passing through Poland, but mostly not stopping there to take passengers. Flixbus is a notable exception - their Prague - Kyiv services also stop at Katowice, Kraków and Rzeszów en route to Ukraine. Timetables can be best viewed using the Czech integrated timetable at jizdnirady.idnes (English version available). Advance reservation is recommended and for most buses also possible online at amsbus.cz. Buses can get you from the West to Lviv far faster than trains. However, they are targeted primarily at Ukrainian emigrant workers earning their living in the Czech Republic. Nonetheless, buses are now in most cases modern Western-built coaches (many of which have amenities such as power sockets and free WiFi) or sometimes used western buses, but still with air conditioning. There are at least 5 connections per day but often much more. If you don't travel around religious bank holidays in Ukraine, with arrival to Prague on Monday morning or departure Friday or Saturday from Prague, buses are generally not full and you'll have often 2 seats per person as tickets aren't usually cheap and bus lines are very profitable. There are bus services to Odesa from Chisinau. Both buses which go through unrecognized Transnistria and those who are taking an indirect way outside Transnistria. Departure approximately every third hour during daytime. There are some ferries from Istanbul, Georgia, Varna (Bulgaria) to Odesa or to Crimea (currently occupied by Russia). See Ferries in the Mediterranean. The nearest significant town on the Polish side is Przemysl, and it's easy to find by following route #4 (which passes through Przemysl), also known as the E40 in European terms. As of 2016, the road is a motorway all the way to the border. When you arrive, you will see a queue of trucks and vans parked to the right of the road; a hard-core parking area with cafe/bar to the left. Don't stop behind the goods vehicles, slip up the side of them and then feed into the customs area when the guy flags you forward (for courteous Europeans, you're not jumping the queue - commercial traffic goes through a different process). If you're in an EU registered car then make for the EU-passports, passport control section. Thence to Ukrainian passport control and then Ukrainian customs and then you're through. It used to be a nightmare, with apocalyptic tales of 5-6+ hours at the border, but the Ukrainians have made great advances in efficiency and it takes about an hour to make the crossing (2016). Once through, just follow the main road towards Lviv on the M10 (E40) - this is the route right across Ukraine to Kyiv (and thence on to the east). Stick to this - the main towns on the way are Lviv, Rivne, Zhytomyr. Watch out about 15-20 km inside Ukraine, in Mostyska, as police is actively checking traffic measures here (speed exceeding). There are two road border crossings between Slovakia and Ukraine: (Malyj Bereznyj-Ubla and Uzhhorod-Vysne Nemecke). The former one is for cars (not trucks), pedestrians and cyclists, and the latter one is for motorized traffic only. No pedestrians or cyclists are allowed. You can walk across the 200m long bridge from Sighetu Marmatiei, Romania. Once you get to Solotvynoe, Ukraine, you can continue your travel in a car or a train. Bicycling is also a good possibility in summer. Note that you cannot cross the border at Kroscienko (Poland) on foot or by bicycle. You must be in a vehicle. Coming from Poland by bicycle in August 2011 it took about 5 minute of waiting to flag down a driver who was willing (and had space) to take a person, a bicycle, and a full cycle touring kit. The actually crossing then took about an hour or so. There was no charge by the driver or the immigration officials. There is also a border crossing between the small villages of Mali Selmentsi and Velke Slemence, Slovakia (open only 08:00-20:00), which is for pedestrians and cyclists only and only for citizens of the European Economic Area and Ukraine. Holders of different passports will be rejected. This border crossing is of no particular importance to tourists; its only advantage is the absence of queues, which are ubiquitous at border crossings for cars, especially at those on major routes. Instead of waiting several hours, you can get to the other side in a matter of minutes through this border crossing. Be aware that all foreigners are subject to higher security measures by police when travelling on public transport, especially intercity forms of it. Be prepared to show your passport and entry papers, and keep your embassy/consulate number handy in the increasingly-unlikely event you come across a corrupt official. If you are caught outside your base city without your official documents, be prepared for a big fine (unconfirmed). This is a particular issue if you drive as there are traffic police who regularly stop drivers and demand their paperwork. The quickest way to get around big cities is the mini buses or subway (only in Kharkiv, Kyiv, Dnipro and Kryvyi Rih): the minibuses follow routes like the regular buses do. You can generally flag them down or ask them to stop at places other than the specified bus stops. The fare is paid as soon as you get in, and is fixed no matter how far you want to go. This is the same for the conventional buses, tram, trolley-buses and the Metro. Tell the driver that you want to get off when you are approaching the destination or press the designed button to give a signal. Each city has an intercity bus station from which you can go pretty much anywhere in Ukraine. Fares and quality of service vary widely, depending on provider. Trains are operated by state-owned Ukrainian Railways . Tickets may be purchased online on http://booking.uz.gov.ua/en/. The website has English and mobile versions using VISA/MasterCard. E-tickets will be sent to your email. A customer service officer may be contacted by SKYPE (do not wait until adding you as friend, just send a message and wait for a reply). The website is designed mainly for the purchase of tickets between cities in different regions and also tickets for international trains departing from Ukraine. Baggage places or transportation of irregular objects/animals may also be included in the ticket price. ID document is required upon boarding. You do not have to print a ticket purchased online (however it's better), but you must have it at least on your smartphone. Tickets purchased online can be refunded. Many Ukrainian trains are quite old and slow compared to European standards (except, probably, Intercity+ trains which are available between major cities, such as Kyiv, Kharkiv, Lviv, Odesa, Dnipropetrovsk, etc.). From the other side, they are punctual, reliable and very cheap (EUR 3-6). For example, a journey from Lviv to Kyiv (about 520 km) will cost you: - About 120-200 UAH (~€5-8) on 2nd or 3rd class sleeping car (kupe or platskart), about 9-10 hours of travel; - About 280-530 UAH (~€11-21) on 1st or 2nd class Intercity+ train (no sleeping car, just regular seats), about 4.5-5 hours of travel. Generally, in Ukraine, for long distance the train is preferred over the bus because of their comfort and because often they are even cheaper and safe. The "Lux" sleeping cars have a two-berth cabin. Second class has cabins with four berths. Third class has six berths through which the aisle passes. Because trains are popular in Ukraine you might have to buy the tickets in advance. This is more often the case for third class. You can check availability and even buy tickets online at Ukrainian Railways e-shop website . It is available in English, Russian and Ukrainian. The e-shop offers both domestic and international (CIS only) tickets starting in Ukraine. You can choose the desired train, the seat(s) and buy the ticket(s) online. Visa/MasterCard are accepted. Please also note that depending on the selected train the tickets may be of different types. Some of them (with QR code) could just be printed or saved to your smartphone, whereas the other ones (with barcode) should be exchanged at the railway station's cash desk before boarding the train. The signs are mostly in Ukrainian (Cyrillic alphabet) only. Only major highways are equipped with signs written also in the Latin alphabet (including village names), the rest of the roads have only Cyrillic signs with a few signs written in the Latin alphabet indicating main cities. The best option is using GPS navigator. You can also have a good road map (those available are mainly in Ukrainian, but Latin alphabet maps are starting to appear) because place names aren't well posted on road signs. Important! Since Jan, 01, 2018 the speed in cities will be limited to 50km/h (30mph), like in most European countries, instead of existing 60 kph (40 mph). People usually drive faster anyway in a reckless manner. Currently there is a legislative gap, according to which you won't be fined for speeding below 20km/h (i.e. when you drive up to 70-80 km/h in cities, you can only receive a warning, so the police usually don't bother about such offenses). However, this will be changed in the nearest future, so it's advised to keep the speed limits. Fuel is no longer a problem in Ukraine, especially for those who remember travelling to Ukraine during the early 1990s, when petrol was considered precious. Today, there are plenty service stations. There are varying types of fuel, such as diesel, unleaded 95 octane, and (more rarely) unleaded 98 octane; one finds also 80 and 76 octane. Note that if you choose to fill-up in a rural filling station, you will need to pay first, and in cash. Even there many stations do accept credit cards, however. The prices are slightly cheaper comparing to neighbouring EU countries, but more expensive, comparing to Russia. For example, 1 litre of 95 octane petrol or diesel will cost you about 20-23 UAH (€0.8-0.9) (April 2015). Road works have been ongoing, but the quality of the roads is shy of Western Europe (with the exception of Kyiv). The lighting in small towns and rural areas is poor or not-existing, so it's better avoid night driving, especially on secondary roads. If in doubt, it's best to not drive at all, as many drivers in Ukraine do not comply with laws and drive often recklessly, often causing fatal accidents for foreigners and locals alike. Until a few years ago, corruption among police officers was a major concern in Ukraine. However, since the Euromaidan demonstrations, the police service has been completely reformed and modernised: the Militsiya was replaced by the National Police of Ukraine in 2015, and roadside corruption is now pretty much nonexistent. All police officers wear body cameras to monitor their performance, the footage of which is uploaded to social media and even broadcast on a local reality show! When you are stopped for speeding or other offences, it is now extremely unlikely that you'll face bribery, however, this still might be possible. If you're asked about "reductions" if you pay on the spot, demand a written ticket for you to pay later instead. Don't let them intimidate you. It's very useful to have an embassy phone number handy for these cases. If you mention that, they'll let you off the hook quicker than you know it. At any rate, write down the officers' badge numbers, rank, plate number of the police car, and notify the nearest embassy/consulate in detail, to help fight these corrupt practices. Fines are rather low (comparing to EU countries), starting from 340 UAH (€13) in most cases (such as speeding >20 km/h) and up to 6000 UAH (€240) for driving being drunk. In some cases the fine could be paid immediately using Visa/MasterCard, but this is rather an exception for now. There are two major bus companies that run buses from all of the major cities to and from Kyiv: they are Avtolux, and Gunsel. Prices run about UAH200-220 (USD20-27) for service to Dnipro and Kharkiv. The major advantage that the bus service has, is that it leaves from Boryspil  and stops in Kyiv, so if your destination is not Kyiv, its easier then taking a bus to the Main Passenger Railway Station  in Kyiv. They are standard coach buses, serve cold drinks and tea, show movies, and make a stop about every 3-4 hours. Buses  run every few hours. VIP bus to and from Odesa that has nice leather seats and is more less non-stop. It departs once a day, takes four hours or so both to and from Kyiv and costs about 200-260 UAH (2014). Ukraine International Airlines  offers cheap flights and can be a time-saving alternative. However, be sure to book early for the cheapest fares. The flights can be booked online comfortably in English. Ukrainian is the official language. Near the neighbouring countries, Romanian, Polish, Belarusian, Hungarian and Russian are spoken. Ukrainians either speak Ukrainian or Russian natively, with Ukrainian being move common in the west and Russian in the east/south. Most Ukrainian-speakers also speak Russian at least to a moderate degree, owing to the country's Soviet past. However, due to the ongoing conflict with Russia, locals in Ukrainian-dominated areas may not like using Russian (but will usually be OK doing so with Western tourists), so learning at least some Ukrainian as well will be seen as respectful. In the central and eastern parts of the country, you may also find people using these two languages simultaneously (so called surzhyk—mix of languages), which has become the most common thing in historically mainly Russian-speaking Kyiv since the conflict with Russia. It is also common for people to talk to others in their native language, irrespective of the interlocutor’s one, so a visitor speaking Russian may be responded to in Ukrainian; however, Ukrainian and Russian are not highly mutually inteligible. In Crimea there is also a nourished community of speakers of Crimean Turkish; a Turkic language closely related to Turkish, Turkmen and Azeri. Young people are more likely to speak a little English, as it is the most widely taught foreign language in school. Most people in the tourism industry (hostels etc.) however do speak English well. If you are traveling to Ukraine, learn basic Ukrainian or Russian (know your phrase book well) and/or have some means of access to a a native speaker, a mobile/cell/handy number can be a godsend. Google Translations are quite accurate; also, Google has recently introduced text-to-speech feature for Ukrainian, so once a phrase or sentence is translated in your app you will be able to press 'sound' button to hear the spelling of the word/sentence. Virtually nobody in any official position (train stations, police, bus drivers, information desks, etc.) will be able to speak any language other than Ukrainian and Russian. It is a good idea to familiarize yourself with the Cyrillic alphabet to save you a lot of time and difficulty. Nearly all signs are in Ukrainian. 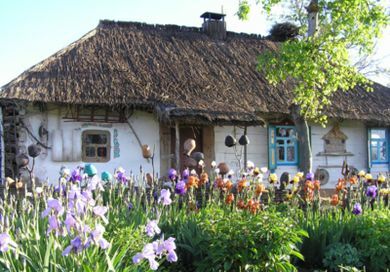 Ukraine is a country worth seeing and visiting over and over. 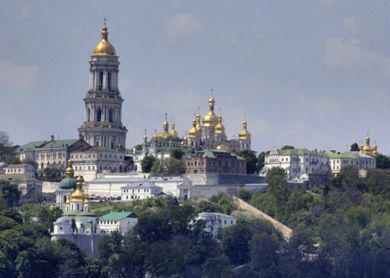 See UNESCO listed Lviv centre, Residence of Bukovinian and Dalmatian Metropolitans in Chernivtsi, Saint-Sophia Cathedral and Pechersk Lavra in Kyiv. Hike in Carpathian Mountains around Rakhiv. Conquer 2,061m Hoverla, part of the Chornohora mountain range. Kayak down Dniester and admire Kamianets-Podilskyi and Khotyn castles. Chill out on Odesa beaches in summer. WARNING: Be aware that is illegal to take any items of historical importance out of the country. This includes badges, medals, icons, historical paintings, etc. This law is strictly enforced at all exit points of the country and one risks heavy fines and/or imprisonment. Ukraine's official currency is the hryvnia (₴, UAH), and you will certainly need it to purchase goods. Currency exchange points that exchange Euros, US dollars, Russian rubles and British pounds are very common in cities, and the exchange rate is usually very fair (except in Kyiv, where the exchange rate is higher compared to other cities). You may also exchange money in any bank branch (in Ukrainian, bank is written 'Банк'). When doing person-to-person payments, you might be able to pay in Euros or US dollars, as those are widely recognized, and you might in fact get better rates than in official exchange points. However, be careful, because it's not legal to make payments with foreign currency. The biggest ATM provider in Ukraine is PrivatBank (ПриватБанк). However, the bank may charge a 4% fee of the withdrawal amount if a foreign bank card is used (it may be different in other banks). ATMs accept 4 digits PINs and have an English language interface option. If you don't want to have trouble exchanging money keep one of these currencies: EUR, USD, GBP. In South and East Ukraine, it is almost impossible to exchange other currency. However, in Western Ukraine (especially in Lviv), Polish złoty can also be exchanged without any problems. It worth opening a bank account in PrivatBank. You will need local phone number (it is required for login). Best is to buy or order LycaMobilewhich is a prepaid fee-free SIM. For PrivatBank, All cards are VISA or MasterCard. Online banking is excellent. You may transfer money to any VISA/MasterCrd in the world for just 2% fee. You may access CVV2 code and expiry date of the card online. You may open internet cards in EUR/USD/UAH currency (10 years validity). You may change card PIN by sending SMS to bank technical phone number. You may charge SKYPE, pay bills, buy food/flowers/water, get card statements. Online banking has English version. In branch you may open a card in UAH/EUR/USD. Another type of machines, self-service terminals, accept USD and EUR deposit directly to your card. Banks has 24/7 online chat support. Most transactions are credited real time. You can make moneygram and western union transfers (both receive and accept online). Note that you cannot make foreign currency transfers within Ukraine, only in UAH. If you pin Ukrainian USD or EUR card to PayPal, default billing currency will be UAH, call PayPal to change it. PrivatBank name cards with photo (costs 2 USD, wait for a week to get) or PrivatBank MasterCard cards may be used to pay for subway in Kyiv (and maybe in other cities also possible; all cards with PayWave and PayPass should be accepted, please double check it). Before leaving Ukraine be sure that you have activated your cards (by changing default pin code) and you new phone number (You can do it even abroad by sending sms command to technical bank number). Unlike other banks, PrivatBank is from 2017 national bank, government owned so all deposits are safer to be kept here. You may manage them online. Financial phone (required for login) may also be changed online. Another bank to consider is MONO bank which is very similar to PrivatBank. If you want to buy any kind of artwork in Kyiv, the place to visit is Andriivskyi Uzviz (Андріївський узвіз in Ukrainian). Ukrainian cuisine is tasty, and just as other cuisines in the region uses a lot of fat ingredients, especially in the festive dishes. Traditional local food includes "salo" (salted lard) and soups like "borshch" (борщ in Ukrainian) made of red beets which is a delicious meat soup. The first, salo, is perhaps something you might not make yourself try - however is a delicious side dish, as for the soups being a must-have dish. Varenyky (dumplings with potato/cheese/cherries/fried cabbage and other things) are another must-try. You may also find nice places to eat not by signs, but just by the smoke of traditional wood fires. Restaurateurs are very friendly, and, more often than not, you will be one of their first foreign visitors. Next to the "borshch", you might also ask for "varenyky" (вареники in Ukrainian, dumplings filled with meat, vegetables or fruits) or "deruny" (деруни, potato pancakes). You have to try varenyky with potatoes and cottage cheese in a sauteed onion and sourcream sauce, a fantastic dish. These are just starters, but ones that might fill you up quickly. The legal drinking and purchasing age of alcoholic beverages is 18. Drinking in public is not allowed. The Ukrainian speciality is "horilka" with pepper. Other kinds of horilka are also quite popular - linden (tilia), honey, birch, wheat. Prices range from $2 to $30 (1€-20€) for 1L. Souvenir bottles are available for higher prices (some bottles reach upwards of $50 (35€)/0.5L). There is a great choice of wine, both domestic and imported. The domestic wines mostly originate in the south, in the Crimean region - known for wine making dating back to early Greek settlement over 2,000 years ago, although wines from the Carpathian region of Uzhorod are also quite tasty. Ukraine is also famous for its red sparkling wines. Prices for local wine range between $2 to $50 (2€-35€) per bottle of 0.75L (avoid the cheapest wines, $1 or less, as these are sometimes bottled as house wines but sold as local vintages), however, one can find genuine Italian, French, Australian wines from $50 per bottle and more in big supermarkets and most restaurants. The price of imported wines dropped significantly over the last number of years and trends indicate further reductions in price due to inegration of Ukraine with EU. There are a lot of beverages (both alcoholic and non-alcoholic). Ukrainian beer is of very good quality. Beer from barrels or kegs (more common in cafes) is often watered down. Canned beer is not very common in Ukraine and sometimes not of the same quality as the same variety sold in bottles. The best beers are brewed by Lvivske (from Lviv), Obolon and PPB (Persha Privatna Brovarnia, 'First Private Brewery'). Imported beers are also widely available but more expensive – for instance, a bottle of Austrian Edelweiss can cost upwards of $2 US while average price of Ukrainian beer is $0.50 US. All told, Ukrainian beers are very tasty and gaining popularity elsewhere in Europe. Of non-alcoholic beverages, one should try `kvas` – a typically slavic drink made of rye or wheat. During the summer one can easily buy it from designated street vendors. It’s better to buy it in bottles due of unknown cleanness of the barrel. Milk drinks, of all sorts, are also available, although mostly in supermarkets. Bottles of high-quality mineral water are available everywhere, as well as lemonades, beer, and strong drinks. When seeking to buy bottled water make sure to ask for "voda bez hazu" (water without gas) otherwise you are likely to be handed the carbonated drink. Never buy `koniak` (the local name for brandy) except from supermarkets or liquor stores as there are many fakes. Every year a few die or go blind as a result of poisoning from methyl alcohol, a compound used to make fake cheap copies. In Ukraine it's possible to buy Cognacs from other former Soviet republics. The Moldavian and Armenian cognacs are quite good and not expensive. There are many mid-range (€25-45) options outside Kyiv. For instance in Ivano-Frankivsk (near the Carpathians), the going rate is approximately €35 for a suite (bedroom and sitting room) in one such hotel. Many hotels have the choice between renovated rooms/suites ("western style") and not renovated rooms. The last choice is more than 50% cheaper and gives you a spacious old fashioned 2 room suite, basic but clean! There are a number of 5-star hotels in Kyiv and one in Donetsk (Donetsk is occupied by Russia); see guides for those cities for listings. At one such hotel in Lviv, the going rate ranges from €40-60 a night. Another option is to rent an apartment on the internet before you leave your country. There are many to choose from in Kyiv and Odesa. If you would like to go down this route you can either look at airbnb which will have English speaking hosts but higher prices or look at doba.ua which will require some Ukrainian and will have much lower prices, sometimes you can even find entire flats for rent for the same price as a shared hostel bunk would cost in any other place. What many people from ex-Soviet countries do is to go to the railway station, where they try to find people who are willing to rent a room. Prices are usually much cheaper and if there are enough people, offering the room you can make great deals ( especially in tourist cities like in Yalta, people are almost fighting to be able to talk to you). There are a lot of foreign students in Ukrainian universities. Bribery is huge, you can obtain a diploma here having attended just twice (the first and last days of study) if you have money. That's a hyperbole, of course, but the real life is not much different. Of course if one wants to obtain good knowledge they will, but motivation in such a situation is low. Many universities are now offering high quality distance courses. WARNING: Exercise a high degree of caution while travelling into Eastern Ukraine or Crimea. Due to the ongoing Russian-Ukrainian conflict, many people in Donetsk, Luhansk, Crimea, and Eastern Ukraine will most likely react with extreme aggression if you show anything that's supportive of Ukraine, the United States, NATO and the West in general. The situation is extremely unstable and the Ukrainian government maintains a very weak grip on the regions. For similar reasons, do not show anything that's supportive of Russia in Kiev and Western Ukraine. Whatever your political opinions and views of the conflict are, keep them to yourself. The country is in the middle of a very tense, vitriolic, and unstable political situation, and you can expect to be severely harassed, taken hostage or even killed depending on where you go and what your position on the conflict is. Many people will tell you that you can take a copy of your visa with you. Sadly, some people experience trouble with this. It's always better to carry your passport with you. A photocopy can be refused as proof of identity. A phone call to a local who can help can prove very effective. If you can it is useful to have a bilingual acquaintance who can be called in an emergency or if you encounter difficulties. If staying for any length of time, it is advisable to get a local SIM card for your mobile for emergencies and for cheaper local calls/texts. These are widely available, cheap (often free) and easy to 'top-up', even online or via online banking. Operator "Lifecell" may be a good option. In emergency, call: Police - 102; Ambulance - 103; Fire - 101; Gas emergency - 104. Dial short number from any phone. As in any other country, using common sense when traveling in Ukraine will minimize any chances of being victim of petty crime and theft. Try not to publicize the fact that you're a foreigner or flaunt your wealth: by clothing or otherwise. With the exception of Kyiv, Odesa, and other large cities, foreign tourists are still quite rare. As in any other country, the possibility of petty theft exists. In Kyiv, make sure to guard your bags and person because pickpocketing is very common, especially in crowded metro stations. Guides have told tourists to watch certain people because they heard those people say: "They look like Americans: let's follow them for a while and see what we can get." Pickpocketing and scamming is common, particularly in crowded places, in tourist areas, in bars and nightclubs and on public transportation. There has been a slight increase in street crime in Central Kyiv, especially after nightfall. This includes muggings. Pickpocketing on the Kyiv metro has also increased. Armed robbery can also occur, especially in the larger cities Street crime. Don't drink alcohol in the company of unknown people (which may be suggested more freely than in the West). You don't know how much they are going to drink (and convince you to drink with them) and what conflicts may arise after that. Ukraine is a predominantly cash economy. The network of bank offices and ATMs (Bankomats) has grown quickly and are now readily available in all but the smallest villages. Do check the security of the machine - it would be wise to use one that is obviously at a bank, rather than in another establishment. V PAY-cards are not accepted in the country. You can use your credit cards (mostly MasterCard & Visa) or cash traveller's cheques easily. UnionPay cards are not accepted in Ukraine. Credit and debit cards are accepted by the supermarkets. But avoid using your credit/debit cards for payments at establishments in smaller towns as retailers are not trained and controlled enough to ensure your card privacy. Instead, it is widely acceptable to pay cash. Locals (especially businesspeople) sometimes carry and pay in cash amounts considered unusually large in other countries. Don't suspect criminal activity in every such case. Racially motivated violence and harassment can rarely occur. The area around the American embassy in Kyiv is known for the provocateur groups targeting black people, and there have been reports of such attacks on Andriivskyi, the main tourist street that runs from Mykhailivska down into Podil. Particularly in rural areas, having dark skin is often a source of prejudice. Antisemitism is still a lingering problem in some Western regions and/or other parts of Ukraine but this only appears in jokes. However there are two Jewish mayors elected in Kherson and Vinnytsia. Anecdotal experience is that there is some underlying racism in Ukraine, indeed much of the former Soviet Union. Migrants from Middle and Central Asia and gypsies receive much closer and frequent attention from the police. Always have your passport (or a photocopy of the main pages if you're concerned about losing it or if you're staying in a hotel that is holding it) as foreigners are treated more favorably than others. This is not to say that it is unsafe or threatening, but it is better to be forewarned of the realities. Many who visited Ukraine as it co-hosted the UEFA Euro 2012 along with Poland reported that the racism scares were tremendously exaggerated and that people were very friendly. Just like in any country, be vigilant, but the chances of there being violent hate crimes are, for the most part, generally low. Ukrainians are friendly to foreigners and will strive to assist you. Ukraine has some of the worst statistics for road related deaths and injuries in the world so act accordingly. Take care when crossing the roads; walk and drive defensively: be aware that traffic overtakes on both the inside and outside. Sometimes you even need to take care when using the sidewalks, as in rush-hours the black, slab-sided Audi/BMW/Mercedes sometimes opt to avoid the traffic by using the wide pavements; pedestrians or not. Owners/drivers of expensive cars have been known, at times, to be more careless of the safety of pedestrians and other drivers alike. Drivers rarely grant priority to pedestrians crossing a road unless there are pedestrian lights. Always watch out for your safety. If in doubt, do not drive if concerned about your safety. Carjackings also occur in Ukraine, so take upmost precautions as carjackers would seek late-model vehicles by gunpoint. Also be warned that pavements suffer in the same way as the roads in terms of collapsing infrastructure. Take care when walking, especially in the dark and away from the downtown areas of the main cities (a flashlight is a useful possession) as the streets are poorly lit, as are most of the entries/stairwells to buildings, and the street and pavement surfaces are often dangerously pot-holed. Don't step on man-hole covers, as these can 'tip' dropping your leg into the hole with all the potential injuries! Due to ongoing fighting between Russian occupants and Ukrainian forces, travel to Donetsk at this time is extremely dangerous. The only way to stay safe is to not go. You should avoid all travel to this region. If you are in the region, the best thing to do is leave immediately to the area controlled by Ukraine. If for some reason, you must travel to or stay in Donetsk, do NOT wear anything symbolizing Ukraine, the US, EU, the Crimean Tatars or NATO and avoid discussing the situation if possible. In emergence try to contact international organizations like OSCE/Red Cross or pro-Ukrainian citizens. UXO (armed ordnance), including landmines, can be littered along the streets, particularly along the border it shares with Ukraine. Note that Ukrainian police/army/hospitals do not function in these areas and you may not be given these services. Be aware that basic services could be disrupted at any time and travel could be limited by checkpoints, fighting, or infrastructure damage. If you are in or are going to Donetsk, see war zone safety. 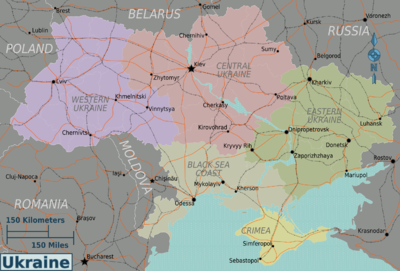 Do not speak Ukrainian in this region. The same thing applies for the Luhansk region as well. Do not speak out against the current separation of Ukraine at all, and again, do not wear anything related to Ukraine, the US, EU, Crimean Tatars or NATO and do not speak Ukrainian. Avoid taking pictures of military convoys for you could get in trouble for being considered a spy, or possibly get killed on sight. The northern part of the Luhansk region remains relatively safe. The 2014 Ukrainian elections were held with little disruption here. Further into the interior of Luhansk region and around the city of Luhansk are much more dangerous, and, for the time being, are NOT fit for tourism. Avoid anything that is not under Ukrainian jurisdiction. Dnipro is reported to be much safer than any Eastern Ukrainian city. There is much more Pro-Ukrainian counter protests than Pro-Russian protests. Unlike regions of Luhansk and Donetsk, you can wear the insignias of Ukraine, the US, EU, Crimean Tatars or NATO, however AVOID wearing anything related to Russia or Transnistria, for there are many Pro-Ukrainians living in the region, and you could get into fights pretty easy, however, nothing too severe such as being shot to death or captured as a hostage. After Russia occupied part of Ukraine, everything related to Russia is logically not welcomed anywhere in Ukraine as it is usually used to provoke Ukrainians about Ukraine's territory integrity. There is radiation contamination in the northeast from the accident at Chornobyl nuclear power plant in 1986. However the effect is negligible unless you permanently live in Chornobyl area itself. There are even tours to the town of Prypiat which is the closest to the station. The town is famous for the haunting scenery of blocks of apartment buildings abandoned in 1986, now standing out amid the vegetation which spawned from years of neglect. Do not drink tap water. Major reason of this is that water in many regions is disinfected using chlorine for desinfection, so taste is horrible. Whenever possible buy bottled water, which is widely available and has good quality. Many hospitals in Ukraine are by far below medical standards, even on most urban areas, so if you are severely injured or ill, then it's best to be medically evacuated to a nearby country with reasonable medical standards, such as Poland, but at a highly expensive cost. Furthermore, Ukraine is not a disabled-friendly environment, so don't assume any disabled-friendly facilities available in Ukraine, as there is rarely any. Respect the fact that Ukraine is an independent nation. You may find that people here are sensitive about being grouped as "Russians", especially after their military agression. You might not want to say "the Ukraine," because some people may feel that usage implies that Ukraine is a region and not a country. Also use of Russian language can be offensive. Raising the issue of Ukraine in the context as being part of the Soviet Union may not always be welcomed by the locals, especially with regards of the Stalin era, which experienced the brutal famine of winter 1932-1933, World War II and a second famine in 1946. Nevertheless, many Ukrainians also remember the recent period of the Soviet Union as the time of economic prosperity. It is best to avoid the topic, unless the stranger you are conversing with deems it otherwise! Speaking about the current Crimea conflict can get you mixed reactions. It had been reported that Ukrainians are more calm talking about it than the Russians. BE CAREFUL of what you say, for you must pick the correct side. If you mention anything about Crimea being Russian, it's a good way for you to get into a fight. This page was last edited on 17 April 2019, at 04:15.